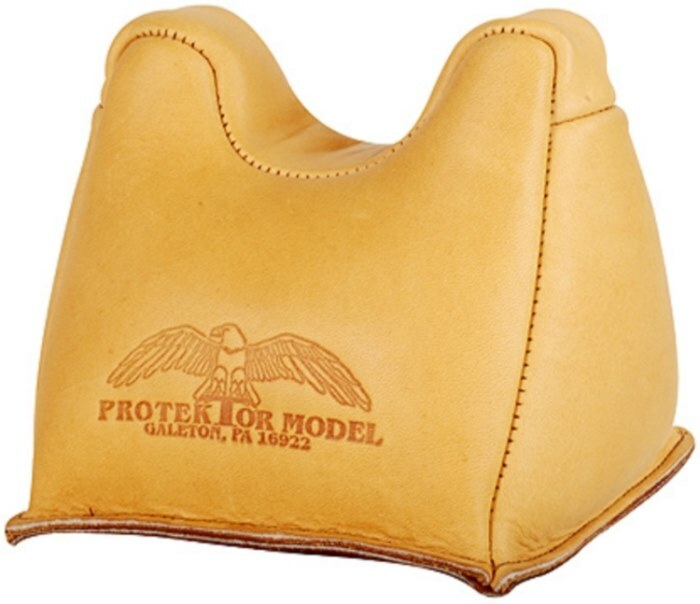 The ProtekTor Standard Front Shooting Rest Bag can be combined with either the ProtekTor Rabbit Ear Rear Shooting Rest Bag or the Protektor Bunny Ear Rear Shooting Rest Bag to become the perfect combination for every shooter; bench rest or otherwise. Bag size: 4" high from bottom to top of saddle where the forend of the rifle rests. A base or block (wood) 6"W x 6" L x 2" to 2 1/4" H (thick) is used under the bag to get to your desired height. All of Protektor Model bags are made in the USA 100% to last a lifetime, you will not be disappointed with these bags! This front bag is used when not utilizing a mechanical front rest. This bag has a height of four inches from the base to the top of the saddle. Good for all shooting, from a sporter to varmint forends. Made with Smooth, Top Grain US-Made Leather. These gorgeous, handmade leather bench bags allow rifles to slide freely during recoil. Made from 3-3½ oz., top grain cowhide, finished in a beautiful cork color. Bag bottoms made from same leather but sueded for a good grip on rest or bench. DuPont nylon stitching won’t rot or mildew. Bags with a “C” sufix have a smooth sliding, Cordura bag with a suede base and tie-down tabs to stay in position on the rest. Brass eyelets won’t corrode or abrade the tie-down, Superb! Bag comes empty, needs to be filled before it is ready to use. Bags can be filled with sand (such as regular play sand or for a heavier bag use chromite sand), tumbling media, lead shot or other similar products. * PLEASE NOTE: Bags are shipped EMPTY. You will need to fill the bag with sand, lead shot or tumbling media before it is ready for use. 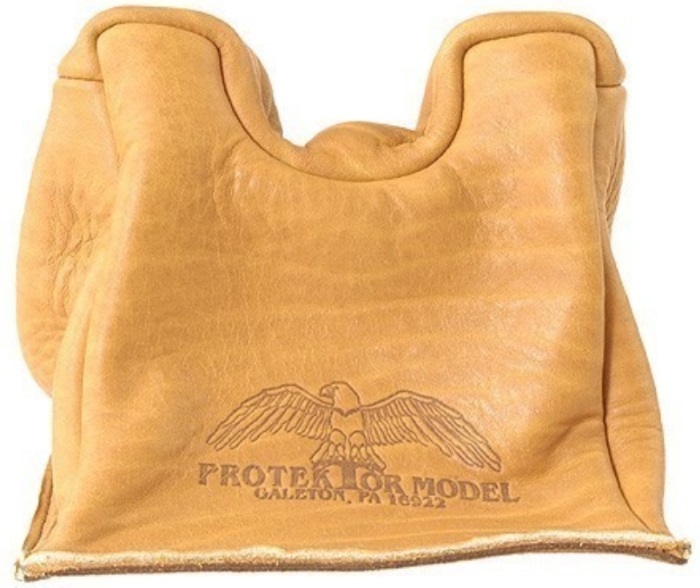 Overview of the ProtekTor Brand and Model - ProtekTor is the original source of sandbag rifle rest and pistol rests. Founded by Basil Tuiler, ProtekTor were the first and are still the best! All leather and leather covered items are made with the finest cowhide leather that is available. They will last indefinitely being sewn with nylon thread testing at 11.7lbs. breaking strength.